"Margaritas with a spicy kick! The agave nectar and fresh lime juice make a big difference. Include the jalapeno seeds for an extra kick!" Pour 1/4 to 1/2 inch of salt onto a small, shallow plate. Moisten the rim of two margarita glasses with water and dip into the salt. Fill with ice, and set aside. Pour the tequila, triple sec, lime juice, agave nectar, and jalapeno into a cocktail shaker over ice. Cover, and shake vigorously until the outside of the shaker has frosted. Strain into the prepared glasses, and garnish with lime wedges to serve. 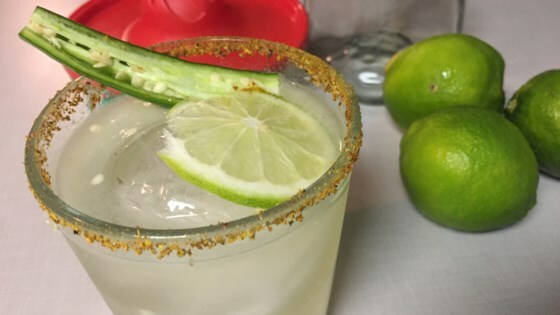 Spicy & refreshing, this amazing marg’s infused with hot pepper & cool cucumber. You can also use a garlic press to squeeze jalapeno juice out of thick slices. This is delicious! Don't trust me, just try for yourself...who doesn't love sweet and spicy?? Yum!! Just the right amount of spice. Nice not to have a normal margarita! !